One of the earliest incarnations of the dunk contest can be found in a game that I’ve already covered in Wayback Wednesday, namely Jordan vs Bird. As I mentioned in that retrospective, Michael Jordan was the only player who could take part in the game’s Dunk Contest, much the same way that all players controlled Larry Bird in the Three-Point Shootout. Users selected from one of ten dunks from MJ’s repertoire, and then tried to perform them. This required taking off from the appropriate spot on the floor for each dunk, and releasing the shoot button within a certain window. The more precise your timing, the higher your scores would be, up to a perfect score of 50. It may seem like a primitive approach now, but it was fairly advanced for the time, and certainly effective. There is a satisfying challenge in learning all of the spots on the floor and mastering the perfect timing. Of course, you are limited to those ten dunks and all participants control His Airness, so it does get old somewhat quickly. 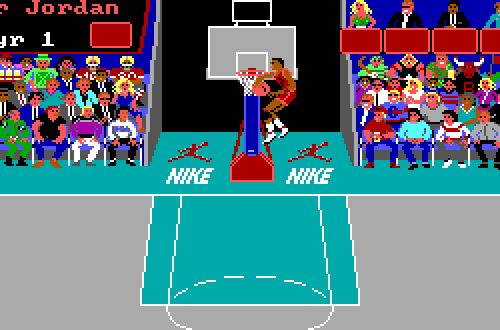 There was a “Follow the Leader” challenge in which you had to copy the previous player’s dunk and try to get a better score, but without the ability to create new dunk combinations, there wasn’t a great deal of replay value. Still, the concept holds up pretty well, and it’s not a stretch to say that it was ahead of its time. Sadly, the dunk contest would go missing from basketball games for a long time. As the games sought to get deeper and more realistic, features like the dunk contest and three-point shootout always seemed to be on the backburner. The shootout made its way into a few games over the years, including NBA All-Star Challenge and the 98-2000 editions of NBA Live, but the dunk contest was nowhere to be found. As such, it remained a staple of our Wishlists from the late 90s into the early 2000s. Because it was such a desired feature, the contest was also the subject of many rumours. Quite a few urban legends sprang up about how to supposedly unlock it in several games. Usually these rumours revolved around winning the championship in season/franchise mode, sometimes with additional requirements such as sweeping the NBA Finals, or beating the Chicago Bulls’ then-record of 72 wins during the season. Button codes and other methods of unlocking the contest were also suggested, with gamers trying them to no avail. Combing through the code and art assets proved that there was no dunk contest in any of those games, which wasn’t a surprise. After all, there was absolutely no way that EA Sports or any other developer was going to have such a sought after feature (and a strong selling point) tucked away as a secret unlockable. That much was obvious when the Slam Dunk Contest finally appeared in NBA Live 2005, as a standalone event and in Franchise mode. It was heavily promoted during the preview season, and featured prominently in the game’s introduction. It didn’t disappoint, with mechanics that I still believe made for the best dunk contest we’ve seen in a basketball video game. Each of the face buttons is used to perform a gather, such as one-footed, two-footed, and 180 (or a 360 by rotating the left stick). Once in the air, each button began a trick (windmills, clutches, etc) and had to be released at the right moment. The shoulder buttons were modifiers to perform further tricks. Lobs were thrown using the right stick, with many different kinds of tosses based on the direction of the stick, or whether it was held or tapped. 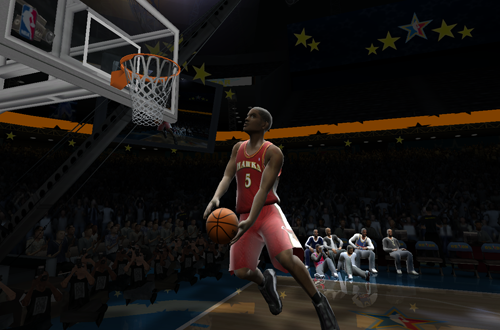 By using the D-Pad, it was not only possible to toss the ball off the backboard, but also the nearby camera, and even the big screen. There were a few simple combinations (like the double between-the-legs dunk) that guaranteed high scores if you pulled them off, but the key was to string together complicated and original combinations, preferably off a lob, for more originality and a higher score. To make the process easier, the trick portion of the attempt went into slow motion, an approach that really helped with the release timing. There were also a few simple dunks that drew low scores, which were handy if you didn’t need a high score to advance and wanted to save a dunk for a later round. This was important as repeating a dunk that had already been performed would draw lower scores. This is where lobs were handy, as even if the trick was the same, performing it off the lob was considered enough of a new spin. It was a lot of fun trying to come up with new combinations, as well as perform the very tough 540 and 720 dunks. As with the Three-Point Shootout, the contest featured commentary from Ernie Johnson and Kenny Smith (later replaced by Greg Anthony), making it a little more special. Visual Concepts also ended up adding the dunk contest to NBA 2K, though originally as a mode of play in Blacktop. While 2K’s version of the contest included a notably wider array of tricks and the ability to jump over obstacles, overall its mechanics weren’t as good. They involved two quick movements of the right stick to choose a gather and trick, then pressing the right shoulder button in the middle of a meter to finish. Compared to NBA Live’s face button method, it didn’t feel as precise. 2K’s contest also took place at Rucker Park with its own rules and format, while NBA Live’s took place in a stadium and was more similar to the real slam dunk contest. 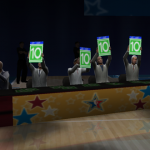 Sadly, NBA Live 09 is the last NBA Live game to date to include All-Star Weekend, mode, though 2K still features the Dunk Contest alongside the Three-Point Shootout. It is currently only available in MyCAREER, MyGM, and MyLEAGUE however, and while the presentation is more realistic, the rules still tend to differ from the actual event. 2K has also experimented with Guitar Hero-like mechanics, i.e. punching in a long string of buttons as they appear, and now a more straightforward approach of choosing the trick and completing a short button sequence. It doesn’t feel as fun, and the lack of a standalone event and practice mode definitely hurts the experience. In my opinion, nothing beats the method that EA Sports utilised for the dunk contest from NBA Live 2005 through NBA Live 09. From its presentation complete with special commentary, to the rules, format, and mechanics, it’s the best representation of the contest on the virtual hardwood. It’s my hope that we’ll see it return at some point, and that NBA 2K can also polish up its approach to the contest, not to mention offer it as a standalone mode. 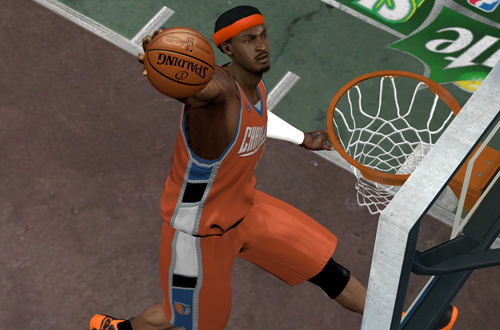 As it stands, the dunk contest in older NBA Live titles makes them fun to revisit. Innovative and intuitive, it accurately captured the excitement of the famous event, and allowed us to soar into legend with our own spectacular slams. I played NBA Live 97, 98, 99, 2000, 2001, 2002, 2003 for ps1 in my playstation 3. The loading time it’s fast and the games play well! I’ve liked Live’s approach with real time button mashing too! I’ve had an NBA 2K13 copy (PS3) with the All-Star Mode DLC, sadly there is its absence in my Wii U copy now to repeat it. I want to blame LeBron too, because he always had a fear to loose in the dunk contest and declined to participate. Other greatest ones, like MJ, Kobe, successfully did it. P.S. Andrew, I’m impressed how you became a man of letters since I’ve become to read you in native. 🙂 Can’t find mistakes: grammar and so on. Thanks, I try my best! It can be tough when you are your own editor, and occasionally I’ll miss something in my proof-reading that someone else’s keen eye will catch, but I do my best to produce entertaining and professional content. I miss All-Star Weekend in NBA Live, as I said I’ve love to see it return. I know what you mean about LeBron not competing all those years ago, too.